And just like that, what was supposed to be their romantic getaway in Vietnam was turned into a mission against plastic consumption. Julia Mesner said it was a Christmas gift from her husband, a holiday in the small beach town of Ho Tram, about 125 kilometers southeast of Ho Chi Minh City. There, they headed up to the Ky Van mountain, which hosts a Buddhist monastery known locally as the Monkey Pagoda. Built in 1990, the sacred place is home to hundreds of the simians. But then, all of a sudden, the spell was broken. "There was this baby monkey eating a plastic bag," Michael told VnExpress, adding that it really bothered his wife. Their son had just turned one a few months ago. "So she kind of had a motherly reaction to it. That thing tipped her over the edge." Julia tried to take the bag from the baby monkey but he ran off. "Well, even if I had gotten this bag away from this baby, I am not going be here tomorrow," she thought. "They’re gonna find plastic and eat it anyway. What can I do about it?" A search for the answer to this question began in the beautiful, quiet forest. 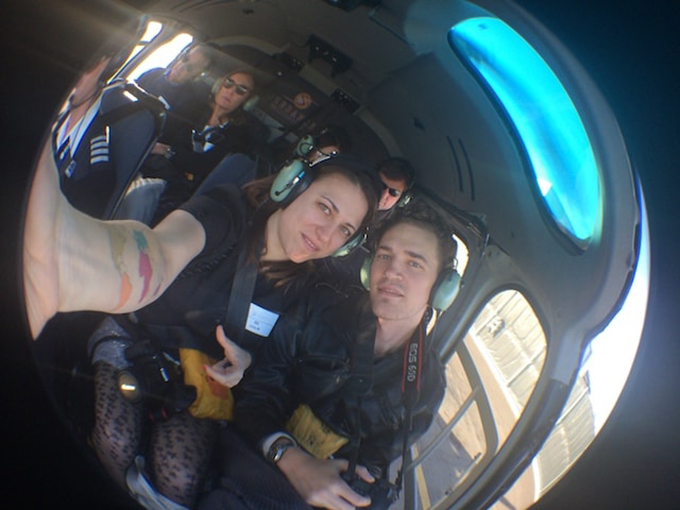 Soon after, Michael and Julia decided on social media project that will reduce plastic waste, starting from where they lived, Ho Chi Minh City. With Michael running a real estate marketing company and Julia being a travel blogger, they were used to an itinerant life. Before moving to Saigon, they’d lived in Bangkok for over a year, long enough to realize that the consumption of single-use plastic items like shopping bags, straws and water bottles was absurdly high. However it didn't hit them until they moved to Ho Chi Minh City last August. "There is plastic for everything. When I go get a coffee, I am getting a plastic cup with a plastic lid, with a plastic straw, that’s also wrapped in plastic. And everything is put in a plastic bag," Michael said. "Once we got here, there was also the element of it not being picked up properly, so we couldn’t help but notice, plastic was everywhere." Michael comes from California, which is probably one of the most eco-conscious states in the United States. And his wife is from Paris which has banned plastic bags for a long time. "We saw the contrast between where we come from and what is going on here. I would say a shocking contrast," Michael said. 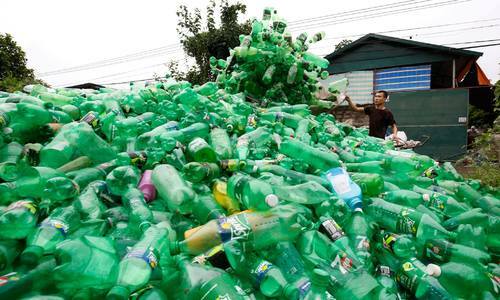 Saigon, with its 13 million residents, churns out 80 tons of plastic waste every day. Around 20 percent of the waste is taken to landfills, where it is left unsorted and untreated, while the rest is either recycled or discharged into canals and rivers that flow into the sea, according to the Ministry of Natural Resources and Environment. In 2015, Vietnam was named in an Ocean Conservancy report as being among the five countries dumping more plastic into the oceans than the rest of the world combined. To do their bit to reduce plastic consumption, Michael and Julia focused on marketing some ecofriendly products under the brand name, Zero Waste Saigon. And they started small, with straws. 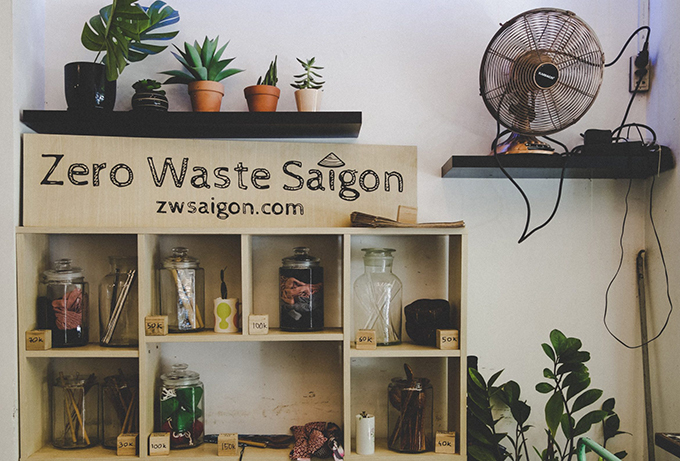 Created in January, the Zero Waste Saigon Facebook page gathered 1,000 members in the first month itself. In seven months it attracted five times the number of followers. Michael and Julia then launched an online store that offers reusable straw made ouf of steel, bamboo, glass and green grass as sustainable alternatives to single-use plastic straws. "Plastic straws may not be the biggest contributor to the ocean waste. But it is the easiest thing that people can give up," Michael said, citing a study done in Singapore in which participants were asked why they used a plastic straw and 60 percent of those said that restaurants automatically put a plastic straw in their drinks and they did not even want it. Michael suggests that people simply say: "I would like my drinks with no plastic straw, please." Zero Waste Saigon focuses on solutions for restaurant businesses to lower their use of plastic while raising public awareness. "I believe that if you change one person’s mind, you’ve saved a certain amount of plastic waste. And if you change the mind of a business, you’ve cut down a lot more of plastic use," Michael said as he showed us straws made out of rolled green grass leaves. These were the most sustainable solution because customers don’t have to remember to bring them, while restaurants didn’t have to clean them, he said. In their small apartment in District 4, Julia and Michael have turned their bedroom into a storage place for eco-friendly products including canvas shopping bags, compostable sugarcane cups and food boxes and handmade crochet jar handles. For now, Julia and Michael are buying straws from Vietnamese farmers with their own pocket money. It is easy to see that they are not making much profit. "We're lucky to have apartments in Paris listed on Airbnb (home rental platform). So we can put in our time and effort," Michael said. Along with online activities, Julia and Michael also use the old fashioned approach. They go to local schools to provide education and community support, and give out free samples to encourage people to become more eco-conscious in their daily lives. "We chose Saigon specifically because it’s a really exciting city right now, there’s a lot of growth happening here. Now is the time when changes are really shaping the future of what Saigon is going to be so we felt we could really come in and be a part of that." It's not government officials or consumers who seem to be leading efforts to move away from plastic straws, but local restaurants. After 10 years of living in the United States, Kevin Bui returned home and started his own business. Since the first pizza bar opened in 2016, Kevin has become the owner of a chain of three pizza restaurants in the city center. When his Pizza Pub, a take-away restaurant, launched its soft opening two months ago, Michael and Julia dropped by the place, which was already busy way before the start of lunch hour. As soon as Julia saw her pizza served on a plastic plate, she came up with a "crazy idea" and asked Kevin to fetch some banana leaves as alternative plates. "At first, nobody believed this idea would work out well," said the 28-year-old man with a baby face, smiling. After a two-month trial, 20 percent of his customers were excited about the environment-friendly approach, the rest seemed oblivious of the change. Even though banana leaves cost Pizza Pub around VND100,000-200,000 ($4.30-8.58) per month, which is three times higher than plastic plates, Kevin goes for it because he sees it as a way to expand his customer base to eco-conscious people. "Because your brand is also what helps your business make more money," Kevin said, referring to thousands of Zero Waste Saigon followers as his prospective customers. He has since stopped putting out straws at all his restaurants though customers can get reusable stainless steel straws on request. Michael and Julia are striving to turn the tide on plastic through restaurants. "We prove to businesses that the customers do care about environment so they want to switch over," Michael said. "Thinking about eco-conscious solution is a luxury for businesses because that’s not their main priority. Their main priority is that they try to stay in business. They won't risk spending money on something their customers don’t care about or maybe they don’t even like." Quan Bui, a well-known Vietnamese cuisine restaurant chain in Saigon, has quickly expanded into five outlets mainly in the central districts. And as waste management became a serious headache for the owner, "we decided to switch to paper cups and cutlery. We've also ditched plastic packaging of take-away meals. Even though packaging costs account for up to 10 percent of each bill, we are consistent with the approach to solve the problem," manager Mai Vu said. Quan Bui has tried paper straws, stainless steel straws and bamboo straws before sticking with grass straws supplied by Zero Waste Saigon. "Change is difficult. But we want to be one of the pioneers," Vu said. 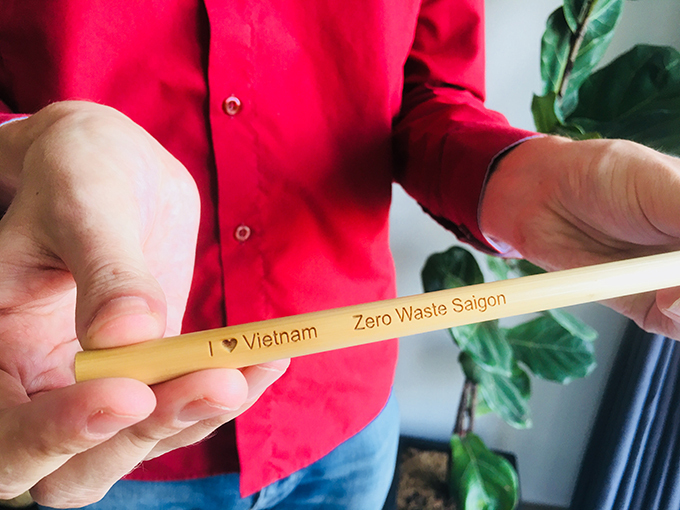 Pizza Pub and Quan Bui are among over 50 local businesses which have purchased eco-friendly products from Zero Waste Saigon. "We are definitely still in the beginning stages of everything. We are not the only one in town, thankfully, that are doing good things," Michael said. Saigon is likely a long way from going completely straw-free, but Michael and Julia are optimistic. "I imagine that one day my son will ask 'What’s a straw?' in the same way that kids now don’t know what a typewriter is," Michael Burdge said. "If he says that, it means that we've fixed it."